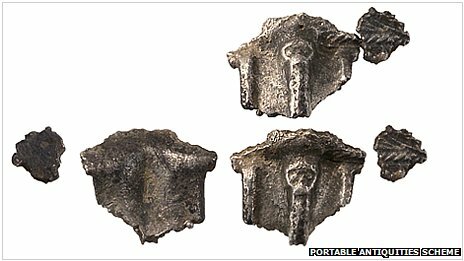 Fragments of an early Anglo-Saxon silver brooch found in Norfolk has given archaeologists new evidence of a cremation burial in the area. 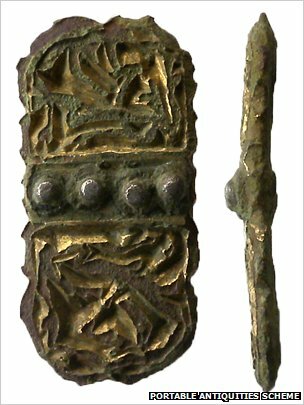 Experts say the 6th Century brooch, found near West Acre, could possibly have originated in mainland Europe. 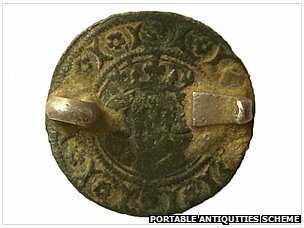 The brooch, along with a Medieval copper coin-like medal known as a jetton and a Middle Anglo-Saxon sword belt mount, has been declared treasure. An expert from the British Museum said the 13th Century jetton was "unusual". The objects were found by metal detector enthusiasts close to West Acre, Flitcham and Great Dunham. Erica Darch, from Norfolk Historic Environment Services, said: "The really important thing about these finds is the location. "Objects can only be used to interpret the archaeology of a particular area or site if we know where they came from. "The more accurate and detailed the find spot, the more useful the evidence." The Norfolk Historic Environment Service and Portable Antiquities Scheme (PAS) records 20,000 non-treasure finds a year from the county. Objects which may qualify as treasure must be reported to the coroner under the Treasure Act (1996). "The Middle Anglo-Saxon sword belt mount was probably made in the late 8th or early 9th Century," said Ms Darch. "Of Carolingian manufacture, it was probably brought to Norfolk by a Viking in the late 9th Century when it was already quite an old object. "The Medieval copper alloy jetton, which has been converted to a brooch, qualified as treasure because the catch-plate and pin-lug which were added to the reverse are made of silver.